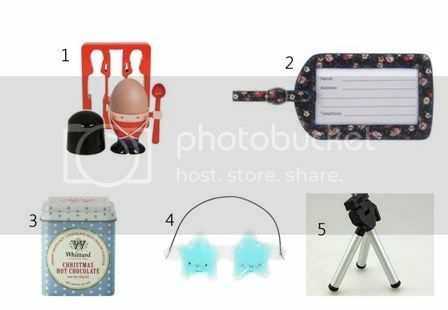 This is the first in my series of gift guides appearing every Friday over the next few weeks in the run up to Christmas to help inspire your Christmas shopping! It's that time of year again when many of us are taking part in Secret Santa at work, or with friends in an effort to save some money! It can be hard, especially with colleagues that you might not know so well, to find a suitable gift on a budget. These are some of my favourite ideas for both men and women all under £5.00! Are you taking part in Secret Santa this year? Next week: Gifts for her, stuck for what to get your mum, sister or girlfriend? 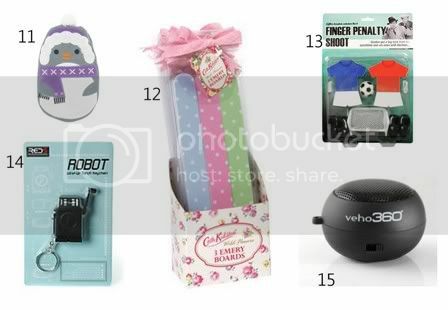 See my suggestions of top gifts for girls! I looove Cath Kidston! I discovered her when my sister gave me a lovely bracelet from her (I'm from Italy that's why I'd never heard about her). very beautiful ideas for the christmas present!!! Thank you for passing to me!! I follow you ever like pleasure..
so many goodies!! sweet ideas for presents, dear. I LOVE HOLIDAY GIFT GUIDE SEASON! And yours is top notch! I have checked this morning lot of presents for my family in christmas haha :D nice items! You find the cutest things! I love that stay eye mask!!! it's just the sweetest. I love the egg and soldier set! <3 I got one for a friend last year! This Christmas season I'm actually going to ask for rain boots I've been eyeing all year long (I hope theyd go on sale by then). I have so many Burt's Bees products and I can never get enough so I'll ask for those too. I like your suggestions and I'll keep on checking back for more. Ooh fantastic selection! Secret Santa is such a hard thing - especially when you get someone you don't know that well. I love posts like this for inspiration! I think these are all perfect.. That is the only pain about buying people stuff, you never know what to get them! 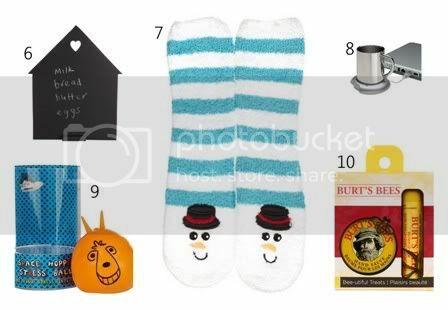 But these all work..
Those socks look like the warmest things ever and perfect for Christmas day! It is so difficult to find gifts for coworkers. I bought mine some amazing chocolate truffles from Harry & David. Great gift guide. Everyone needs this at this time of year! I love that little chalkboard... and the fact it's under £5. I'm so strapped for cash lately it's lovely to see gifts like this that I can actually afford for people. Stocking fillers are all well and good but it's great to see a selection that are interesting.